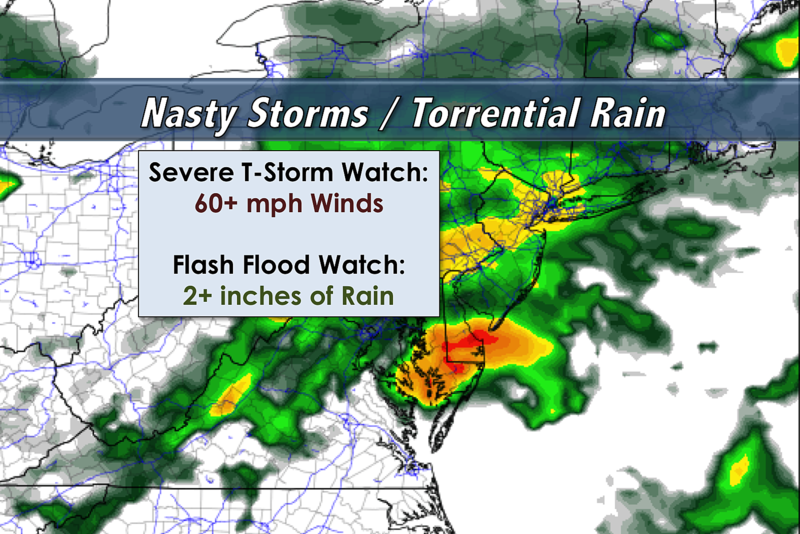 We're now getting a better sense for the timing of New Jersey's impending torrential rain and strong thunderstorms. As of this writing, the first thunderstorms of the day have just arrived in the southwest corner of New Jersey. As the rain spreads northward, all of New Jersey is prone to experience some very heavy rain from Thursday night through Sunday. Live watches, warnings, and advisories issued by the National Weather Service. Remember: a weather watch serves as a "heads-up" — it means bad, potentially dangerous weather is expected or likely to occur. You should remain vigilant to changing weather conditions, and be ready to change plans if warnings are issued. A Severe Thunderstorm Watch is in effect until midnight Friday morning for the following New Jersey counties: Atlantic, Burlington, Camden, Cape May, Cumberland, Gloucester, Hunterdon, Mercer, Middlesex, Monmouth, Ocean, Salem, and Somerset. The primary threat from any strong to severe thunderstorms will be damaging winds. The previously issued Flash Flood Watch was put into effect early (1:55 p.m. Thursday) and extended further north to now include Atlantic, Burlington, Camden, Cape May, Cumberland, Gloucester, Hunterdon, Mercer, Middlesex, Monmouth, Morris, Ocean, Salem, Somerset, Sussex, and Warren counties. This watch expires at Noon on Friday. Additionally, a Flash Flood Watch has been issued for Bergen, Essex, Hudson, Passaic, and Union counties (the rest of the state) starting at 8 p.m. Thursday and going through 6 p.m. Friday. The high heat and humidity in the atmosphere will once again add fuel to thunderstorms through sunset Thursday. That means any storms are likely to become strong or severe quickly as they march northward. (Hence the Severe Thunderstorm Watch through Midnight - see above.) Potentially damaging winds will be the predominant threat from these thunderstorms, along with pockets of torrential rain and dangerous cloud-to-ground lightning. Unfortunately, it will impact the evening commute for at least the southern half to two-thirds of the state. As skies darken up in your neighborhood, it's time to go inside a sturdy building for the night. The latest 3-day precipitation outlook from the Weather Prediction Center puts New Jersey right in the bullseye of 2+ inches of predicted rainfall. As temperatures cool after sunset Thursday, the thunderstorm convection machine will turn down a notch and we'll just have to deal with rain overnight. Now keep in mind, that rain could be incredibly heavy at times, making for low visibility and low traction on the roads. Flash flooding of streets, streams, and other low-lying areas will become the big issue. Models have suggested anywhere from 2 to 5 inches of rain could fall from the heaviest storm cells from Thursday night to Friday. That's a lot! Friday Afternoon to Saturday Morning: DRY? A lull in the rainfall action will bring breaks of sun and pleasant temperatures for a while. Keep in mind: a stray shower or thunderstorm will remain possible at any time, even as the rain should become much less widespread. Friday's high temperatures will be limited to the seasonably warm lower to mid 80s. Saturday morning's low temperatures should fall into the comfortable 60s. The forecast for next round of rain has gotten earlier - now things are looking iffy and soggy again starting just after Noon on Saturday. While this second extended period of wet weather will include pockets of steady to heavy rain, rain totals should be limited to 1 to 2 inches at the most. Certainly still a lot. And, because the ground will be saturated from the Thursday-Friday rain, flooding could occur just as easily. Sunday Afternoon to Sunday Night: DRY? So while the next several days will feature some dramatic thunderstorms and torrential rain, the weekend won't be a total washout. We'll continue to keep you updated as this storm system continues to evolve. Next weather blog update expected by 7 a.m. Friday.